CHICAGO: The Rev. William Barber, Poor People’s Campaign, greeted a massive audience by Video at the Labor Notes conference by saying, “Help save the soul of this nation. It’s not just about contract issues, bigger issues such as racism, poverty, injustice, voter registration are labor issues.” The message was clear: Labor is part of the solution. 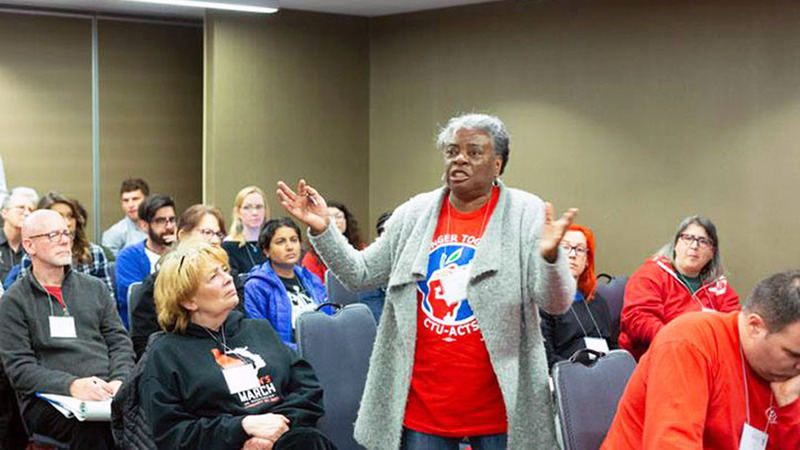 The largest Labor Notes Conference to date took place in Chicago on April 6-8. At least 2,500 people including members of the CP’s Southern California Trade Union Club (TUC) attended. The conference had people registered from 25 countries and over 200 international guests. Labor activists came to Chicago to participate in workshops ranging from basic grievance handling, developing steward skills, bargaining, and organizing members, to more advanced workshops on what works what doesn’t. Over the weekend there were still others including; shop floor and steward skills, health care, education, racial justice and defending everyone, arts, media and tech tools, changing your union, bargaining, contract campaigns, workers centers and immigrant workers organizing, global justice and the big Ppcture for labor. Since 1979 Labor Notes has been a major voice of labor activists by encouraging connections between workers in different unions, communities, industries and worker centers, to help build a stronger labor movement. Labor Notes started out as a monthly magazine moving on to publishing books and holding major national labor conferences. TUC members Ismael Parra and David Trujillo traveled to Chicago for the conference. This allowed us to meet with and engage with other labor progressives from around the country as well as with other readers and writers of the peoplesworld.org. In one workshop Ismael Parra contacted a representative from the Los Angeles Times Kristina Bui one of the panelist in the “Democracy Depends on Journalism, Journalism Depends on the Union”, who agreed to come to a LA Writer’s Union meeting and share the experience of winning union representation at the Los Angeles Times, where they are currently in negotiations. In yet another workshop Tony Pecinovsky, representing the Workers Education Society was a speaker on the panel for the workshop Confronting Right-Wing Strategies Beyond Janus and ‘Right to Work.’ Tony and the other panlist focused on how unions are reckoning with forced recertification campaigns, the loss of dues deduction and the possible loss of collective bargaining. Tony mentioned that one important aspect of winning on this issue is active participation in the 2018 elections. A couple of TUC members felt that a major gap in the conference was a lack of emphasis on winning in 2018. It was 50 years ago that Dr King and Southern Christian Leadership conference called for a Poor People’ Campaign. At the main general session Rev. Barber reminded everyone that “We’re building a movement not a moment.” He emphasized the fact that this movement will move forward only with the help of labor, the church and faith groups, the immigrant communities. Black Lives Matter as well as with local coalitions in cities around the country. The conference participants ended the main session by giving out the Troublemaker Awards to grassroots activists who embody the troublemaker spirit. It was now time for the Trade Union Club members to head back to Los Angeles The Labor Note participants members will report back to the other TUC club members with a renewed commitment to building workers’ power.